Thank you, unfortunately it's the text only documents. I'm trying to find the full-blown originals. Does anybody have them? Now we need all te books. Those are the ones I'm missing. Also "a book in every home"
But we need them in there orgnal copies! seaweed strips drinking freezing cold water with air con on and windows open of my hotel room letting in humid hot raining tropical night air coming in off the indian ocean in which is making clouds in my room?. Watching these very interesting interpretations of ed works from R.L. Poole on youtube with alot of stans russ and many many years and hrs of others in my knowledge base and head. 1.Could the PMH thoery apply to the inside of the EPG?? Perpetual Gas Motion Holder? PGMH ? perpetual Magnectic motion on gas charges once charged? could this charge keep gathering inside epg in the same way on the gasses ? like the PHM theory in these links? Stan mentions EPG takes off to infinity? how about the atmospheric gas charge model? 3 .cloud theory , what happens inside a electolyzer? clouds in cell?. Does vibrating water gas and cell stabilize the magnetic charges? hoes does this apply to epg. Water hit by light absorbing energy heating up? magnetizing ? spliting into gas evaporating with a charge? charged gasses combining and condensing due to like charges ? mountains jungle trees and earth? is cold air con air negatively charged? making lightning? rain? moisture on my air con? extracting energy? = EPG Hmmm , gas lattice? gas battery =PMH? and condensation theories and machines based on it? has the world got it very wrong? I think it has . better get on it. and map the theory. to get the maximum gravity pull from the moon? how is it effected? How does it effect gases and charged gas? how can we tap the electricity charged gas in clouds = tesla knew? bearden says if we create a dipole we attract ether energy rays? what if the water /gas is the dipole already? and compound it under the right conditions?= telsa? with the tower the ground and copper to holding charge as a magnetised bar did? and build energy up off gas charge atmosphere?? was bearden doing the same with his unit? made of high quality magnetic core? does this cycle apply to the very similar looking vic? hmm m very very simple theories over laying all these items here now. "It was said it is very very hard work to keep things simple?" If stans epg works like that with gases he was a genius . off atmosphere ether or atmospheric gas charges or off electron extraction circuit. look at attached pictures look like a pmh with a trickle charge to me. boosting it now we can light LEDS. In response to your question about ED working at night during full moons for max gravity pull. ......... I visited Coral Castle a few years ago. There is a steal door leading in that ED painted a diagram on. Its a drawing of earth with a few celestial objects lined up perhaps moon/ sun / nearby planets, not sure, he did not label any of it, anyhow he has a line painted through all of the objects. Perhaps indicating some kind of alignment. I read he liked to only work at night, mostly I think to keep attention off of his methods. what happens every 21st of the month? or what happens every 21 days? it is that gravity pull is highest or field is weakest ? wow a lot of magnetic pull ? now you see why I am thinking about this. what happening to the field? some one mention postive of negative charged air stream changing polarity to effect elninio ? how does this effect magnetisium and charged feild? used for this any hear of the correct term ? hmmm some renaming going on? i've been doing an analysis of the whole leedskalnin myster and i've come to a few conclusions that i'd be happy to share. 1) there is a lot of misinformation about it. some i think is pushed forward on purpose. 2) valueable info is all but gone. lot's of it is cloked from the public eye. 3) certain conclusions are simpler than is first obvious. it's when you try to make the matter complex that things fall out of line. 4) i've managed to decipher the anagram of the cover of the first book " a book in every home". the most probable solution is " IRON ABOVE HOME KEY"
5) there are more clues left on the covers of the books and in the pictures that ed took of himself than in the actual writings. 7) there are attachments that must be added to the pmh tin order to get the most work out of it. 8) [attachment=2098] this picture is the most telling i belive out of all eds pics. firstly i noticed recently that the cloverleaf design on top is an epitrochoid. i didn't think much of it though until i noticed that it is depicted IN THE PICTURE!! look at the iron pulley with the black epitrochoid on it. remember this is ed's pic and he's trying to convey whatever msg he is! 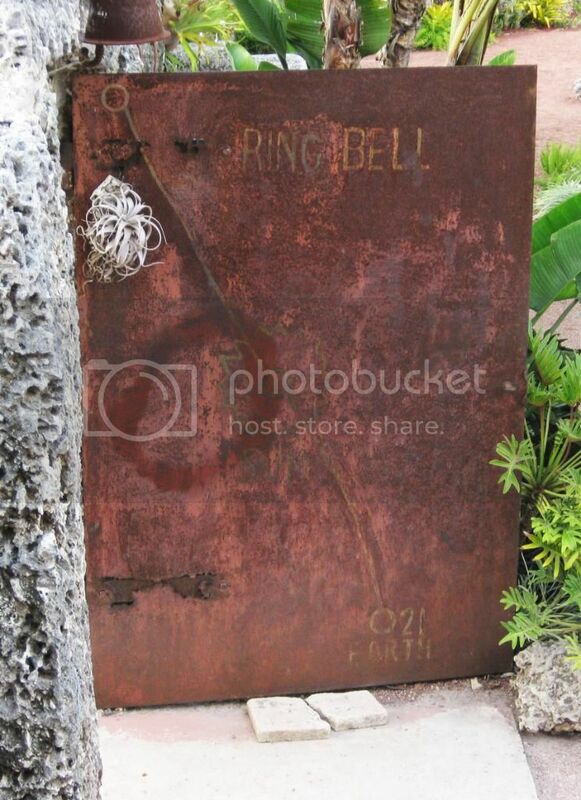 i also found this pic[attachment=2099] which shows that even 90 years later, the epitrochoid is still on the pulley. i don't exactly know WHAT this does in regards to the motion of the wheel, but it IS there and perhaps somebody with a little engineering background can help out. there are 2 pieces of metal that portray magnetic polarities represented by black/white colors. the iron bar laying on the wood is one and the metal holding the parallel to the ground rod that is over the flywheel. there's more... much more!! i'll update some more soon if anybody would like. +1 securesupplies and great post! S.E.G (from prof John searl) I think your right on the money.. The 21 cm Line of Atomic Hydrogen. are you guys suggesting that some form of hydrogen energy was used to build Coral castle? Lol thanks to my buddy Securesupplies ....Here is all the info on the 21cm line you could ever need ...Top man ! Logos to answer your question ..Yes i think he could have.. Throughout History there are reports of occultists and mystics who could levitate themselves and objects by manipulating the air around an object... and Not by levitating the object itself. and then float the stones around like helium balloons from one place to another to build his castle. There's a fair bit of hydrogen in the air so i guess if you could manipulate hydrogen it would be quite powerful ..
the 21cm line ...now Edward Leedskalnin died in 1951... the paper reporting the discovery of the 21cm line was published in 1951 although the line was actually discovered many months before .... I think he already knew his secret but maybe made the painting on the door as a sign post to say "this is where you need to look" after reading the paper on the 21cm line ..
On page 80 of this book printed in 1842 Daniel explains the perpetual motion holder exactly like what Ed used. The book also covers the magnetism of Earth and so on. There are photos of a large tripod and chains and a hoist. It would be no problem lifting blocks and putting logs under to role them around from place to place. It is very hot in Florida so working alone at night when it’s cooler is understandable. Daniel describes a PMH holding a ton or more of weight, coral was once living creatures and as a result is full of holes so compared to concrete should be much lighter. i suspected that water plays a crucial part in the leviation process. the question is how he harnessed it. i found this pic and notice please that it is almost a blueprint for what's found at coral castle. the clover leaf, the bowl under it representing perhaps water, and the twin "tuning forks" attached somehow either through the ehter or with wires! notice how similar they are to the PMH! the key though i think is HOW to connect everything up! i need to purchase the resources to replicate ed's setup. but if anyone wants to try remember that the key is the PMH! the pmh is suppused to be attached between the spools so that it forms a "contiuous" coil. the back ends of the coil, or the open side, is attached to another coil which i think harnesses the "north and south pole magnets" as ed called themwith the use of iron inside of other iron(see Mag Current). the more iron you use the more magnets you can attract. iit somehow MUST resonate and produce a frequency because ED refers to SOUND BASE! audio frequency is the key... audio frequency will produce vibrations needed to produce something like the Hutchinson Effect! i think that a second and possibly third PMH might be needed to get everything working the way it needed to. we also know tat Ed worked with different acids, probably to break the limestones away from the ground. if people have never read magnetic current then it is a MUST read!! extremely confusing because the english ed used is difficult, but i had to go over it like a dozen times to really get the meaning out of it! there IS reference in it to creating antigravity and the "hardware" is used from above the surface of land! if someone has already produced the flywheel and pmh and it is sitting there please hit me up if you'd like to collaborate on experiments. i hear stories about people looking for the V magnets and the "special" numbers 7129/6105195-secret of the universe misinfo, but this is not necessary at this point because it seems that they do not have not much to do with the actual process. a lot of the misinfo out there is a waste of time! even if antigravity is not produced, it WILL be a true electrical generator if set up crrectly. ED promised as much in his book! great video!!! this's man, he can attach wood or stones.!!! same concept with water to pull out neg side and pos side apart.???Meyer??? :dodgy: Yawn yawn! What is it with people !! If you discover something amazing like how to make a "magnetic stone" or The secret of Edward Leedskalnin... Do yourself a massive favour and show someone how it works so they can test it & verify that it works ... !! sorry but the guy in the video looks like he has just made up a crap magic trick that fools no body ..
great book! thanks element 119! it's a book that takes oyu right back to the basics. there are some really great experiments and a lot seems pretty parallel with a lot of ED's writings. Those guys back then wanted to explore every inch of a new discovery. I did the same with double sided tape. Look at the users latest video. First is was about electromagnets in earlier videos. Now is about waving a magazine over a coin. I am sorry you wasted your time looking at the video. With no explanation and not allowing any comments, its clear the youtube user is try to be an A-hole.